I just heard about this new, great discovery from the Canadian Arctic, Puijila darwini, a new primitive semi-terrestrial pinniped. For a long time, the origin of pinnipeds, seals, sea lions, and walruses, was a highly murky and highly controversial subject in mammal palentology. Some have even argued that "pinnipeds" are a polyphyletic, or artificial, grouping, true seals being closer related to weasels and their kin, while sea lions and walruses were cousins of bears. Lacking good fossils of pinnipeds (especially early ones), Huxley thought he saw a connection between the teeth of modern pinnipeds and the primitive teeth of creodonts, which to him suggested that seals were descendants of these ancient carnivores. This made sense at the time, seeing as there were no good early seal fossils and the other major group of aquatic mammals, the whales, were thought at the time to descend from another primitive carnivorous group, the mesonychids. So for some time, due to lack of contradictory evidence, the idea that seals were aquatic creodonts remained on the books. Then along came Enaliarctos. 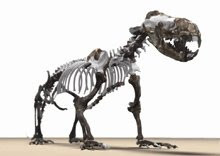 First discovered by Edward Mitchell and Richard Tedford in the Late Oligocene-Early Miocene deposits of California, Enaliarctos was a five-foot long pinniped that seemed to be a transitional fossil between the bears and other arctoid carnivores (Hemicyonids). Its skull was more seal-like than bears, with more uniform teeth, but it still possessed the shearing molars that are present in bears, and in fact all carnivorans. Other features also indicate Enaliarctos was somewhat intermediate betweeen bears and seals in features of this anatomy. Puijila has four lower incisors, rather than six as seen in most extant carnivorans. However, seals and sea lions today also have four lower incisors. Puijila's upper end-molars are small and located towards the midline of the skull. This is a strange arrangement for most mammals, but typical of pinnipeds. Like modern seals, Puijila has a large, well-developed infraorbital foramen, a hole below the eye socket in the front of the skull. This hole allows nerves to reach the front of the skull, and is well developed in species that have well developed or sensitive whiskers...like seals. While Puijila looks otter-like, it has large eyes, like a seal. Puijila has long, flattened toe bones, which are typically found in web-footed mammals. The limbs and tail of Puijila suggest that it swam via its four limbs, like seals and sea lions, rather than a combination of tail and limb strokes, like otters do. Puijila's otter-like features, on the other hand, can be chalked up to convergent evolution. Because Puijila and otters were inhabiting the same sorts of environments, the sleek, otter-like body plan was the one best. In fact this conclusion is vindicated by other fossils in the fossil record. 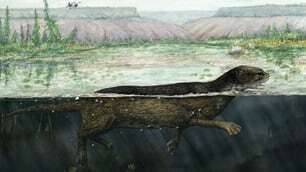 Potamotherium, another early seal, was once regarded as a sort of otter! However, it must be said that Puijila is not the ancestor of seals and sea lions. Puijila dates from the same time as Enaliarctos, about the Late Oligocene-Early Miocene time. Instead, Puijila shows us how seals and sea lions took to the sea, evolving from otter-like forms that thrived on the Arctic coast, spreading south via more oceanic forms into the Pacific and Atlantic oceans, respectively. This amazing find also answers another nagging question about pinniped evolution, do seals and sea lions form a polyphyletic, or artificial, grouping, much like the now defunct classification term "pachyderms". The evidence Puijila gives us emphatically says no to this idea. Recent molecular and DNA analysises have given weight to the theory that seals and other pinnipeds do form an actual taxonomic group, but there are still doubters. Scientists have been arguing for quite some time on these matters. While one group supports the idea that seals and sea lions form a natural group, descended from bears; the other side suggests that seals and sea lions evolved convergently, the former evolving from the otters and the latter evolving from the bears. This side cites the fact the fossil Potamotherium as evidence for this theory, saying that it is the real ancestor of true seals, as well as the fact that sea lions are mostly known from the Pacific Ocean, while true seals are mostly an Atlantic phenomenon. Potamotherium has been reclassified as a very otter-like seal, adding weight against the concept of pinniped polyphyly, but Puijila strikes the final blow. Its features suggest a common ancestry with seals and sea lions, showing that pinnipeds are indeed a monophyletic grouping. Wallace, D. 2007. Neptune's Ark. University of California Press, California. Yeah, sad, isn't it. But on the bright side, its now another of the bizzare pinnipeds that one finds all over the world. I can think of a couple more, such as Acrophoca, and if you read Neptune's Ark it talks about Pelagiarctos, the pinniped equivalent of a super predator. It has fused teeth like a walrus, but fangs like a land mammal. Anyway, I noticed that you have been commenting recently on this blog Luciano. Does this mean you've become a frequent Metazoica reader? That's right. I check this place almost everyday now! I must warn you though, I update rather infrequently. Currently I am putting together articles on the harem-keeping behavior of Megapnosaurus, vampire ecology, and strange enigmas from Texas. But this might take a while, seeing as my paleontological library and my computer are on opposite sides of my house. And Metalraptor: No problem. O'course I don't expect you to post new stuff everyminute. A good post takes some time to be written.